Love your Day-Timer® but want it to feel… a little more like you? There are tons of Day-Timer users that customize their planners to make them more personal. You may be asking yourself, “how do you decorate a planner?” Well we talked to some Day-Timer decorating experts and have pictures of how they personalized theirs! One of our Instagram followers, @craftyscrappymamas, made her own Day-Timer charm! Her style is now reflected in her Day-Timer with things she likes, like an earring of hers and a cute mom keychain. Her Day-Timer charm isn’t going anywhere, either, because it’s snapped into the top ring of her Day-Timer. It’s a clever way to make your planner feel more like you while making it look even more fabulous! What are other ways you can decorate your planner? Spice up your planner pages! Our Instagram follower, @rareph, has such a cute theme in her Family Plus planner pages. It’s Winnie the Pooh! Adding a few stickers to each of your pages can make your week feel more exciting! Opening your planner and seeing your theme will surely put a smile on your face! You can also see the decorative tape on the edge of her paper and on the start of each day to make her pages look more colorful. You can even have a card with a quote on it for each week to keep you inspired! We love how @rareph decorated her planner pages! How much you want to decorate your Day-Timer is up to you! Who knows – it could become your new hobby! It’s a great way to make your planner feel more like you! You can incorporate pages with your favorite colors, quotes or stickers. But be careful, you might have too much fun decorating your planner! 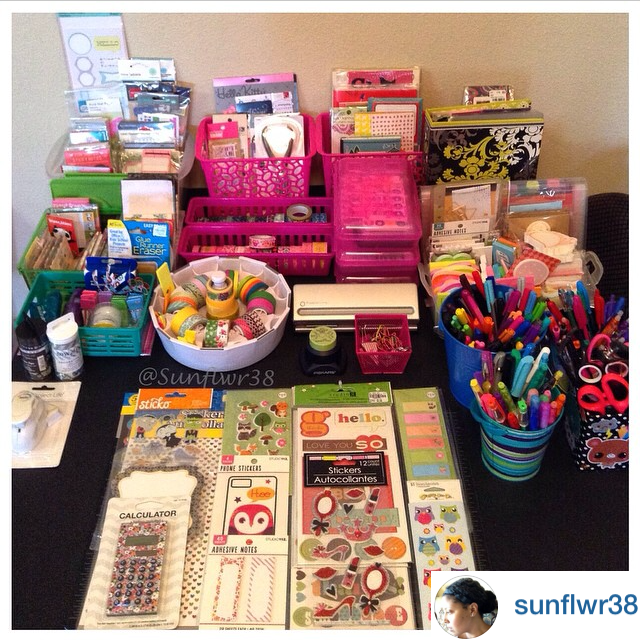 Just check out how passionate our Instagram follower @sunflwr38 is about her crafting – you can tell by her crafting space! There are an infinite number of ways you can decorate your planner to make your Day-Timer feel more personalized!